Another year, another 10K legal walk in honour of raising funds for the Access to Justice Foundation. The annual 10K Legal Walk took place on Monday 9th October 2017 in order to raise money for free legal advice charities. These charities help those in society who do not qualify for legal aid and cannot afford a solicitor. The GCU Law Clinic understand the importance of this and we share this same goal of increasing access to justice. Our volunteers ready to go! A staggering 2/3 of the UK population do not know how to access legal advice and 13 million cannot afford it. Our aim is to widen access to legal services within the local community. Since cuts in both government funding and legal aid have forced many advice centres to close, we are working extra hard to raise funds to help bridge this gap. 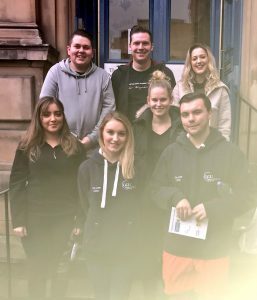 Some of our volunteers and members of our management team headed down to Buchanan Street to represent the Law Clinic in the sponsored walk. Fortunately a dry October evening! Throughout the evening, we walked alongside other advocates of access to justice such as members of Legal Spark and The Law Society of Scotland. 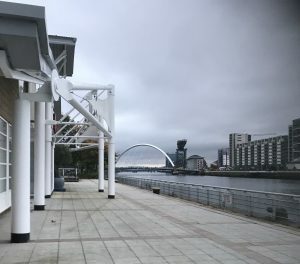 The 10K took us all around the city centre before finishing up where we started, where all participants were invited to go for well-earned snacks and drinks. The GCU Law Clinic managed to raise £175 for the Access to Justice Foundation. The Legal Walk is always a great opportunity for our volunteers to connect with other people in the same field and learn more about their ways of increasing access to justice.